Yoga Nidra is an empowering meditation that starts with relaxation. It systematically changes and cycles through brain wave states, lowering beta and increasing alpha, theta and delta for the better. Yoga nidra literally changes the ‘fluctuations of the mind’ by slowing down brain wave frequencies. Biological sleep only refreshes the bodymind and cannot promote self-realization like yoga nidra can. Feelings of meditative expansiveness are objective biological facts that can be measured in DNA, neurotransmitters, brain waves and more. The physical body changes as the mind changes. During stage one, physical relaxation, stress is reduced causing beta brain waves to lower considerably. In the second stage, abdominal breathing produces a rise in the “feel good” neurotransmitter serotonin as shown on EEGs. Alpha, theta, and delta brain waves also increase. (Fumoto, et al., 2004). The third stage of yoga nidra promotes alpha brain waves. During this stage, mental and emotional balance and mindfulness are the focus. 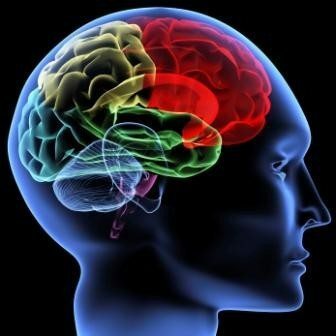 Mindfulness stimulates all 9 functions of the frontal cortex of the brain, promoting memory, concentration, and problem-solving while reducing anxiety and depression. Intuition and creative solutions are associated with theta, the fourth stage of yoga nidra. Anandamide, the “bliss molecule” inhibits the formation of cancer cells. Yoga nidra is happening when the brain is in delta, yet one remains aware. In summary, yoga nidra produces low beta, increases and balances alpha and theta, and produces delta. The physical body changes as the mind changes. Yoga nidra literally changes the ‘fluctuations of the mind’ by slowing down brain wave frequencies. Beta at 13-15 Hz reflects the conscious, thinking mind and the waking state. It’s required for processing information and for linear thinking. Normal levels of beta are good. Low beta, from 13-15 Hz is associated with the body’s housekeeping duties. High beta, from 15-25 Hz, is linked to stress. Anxiety is produced in abnormally large amplitudes of high beta. High beta is also associated with “monkey mind.” It produces high levels of cortisol and adrenaline and many adverse reactions in your body. Fear and anxiety produce high beta. Many beneficial cellular functions are inhibited. Aging is much faster when your brain is bathed in high beta waves. It’s important to know how to keep beta brain waves in check. Alpha is an optimal state of relaxed alertness. During alpha, all brain wave levels of the mind are integrated by connecting the brain’s higher and lower frequencies. Alpha links the thinking mind of beta with the associative mind of gamma with the lower frequency brain waves, which are theta and delta. This allows a flow of consciousness. The alpha state disappears with negative emotions, like fear. A truly integrated person generates large amplitudes of alpha. Alpha tunes the brain to peak performance as well as facilitates gene expression for better health. Alpha improves the immune system. Alpha increases levels of mood-enhancing neurotransmitters such as serotonin. Neurons in the brain’s hippocampus fire in the alpha range (4-12 Hz). Heart coherence is associated with increased alpha brain wave activity. It is a state in which the interval between heartbeats is regular and constant. It produces “an orderly and harmonious synchronization among various systems in the body such as the heart, respiratory system and blood-pressure rhythms,” as reported by HeartMath. It’s produced by positive emotions such as love and compassion. Negative emotions disrupt heart coherence. Feelings of meditative expansiveness are objective biological facts that can be measured in DNA, neurotransmitters, brain waves and more. Theta is characteristic of light sleep and with day and night dreaming. It is the dominant frequency of healers and people in highly creative states. Theta increases in people under hypnosis or in trances. (Kershaw & Wade, 2012). Theta waves are found during DNA repair. It increases the activity of antioxidants. Human cartilage cells are regenerated at the 6.4 Hz frequency. Delta is characteristic of deep, dreamless sleep. High amplitudes of delta are found in people who are in touch with nonlocal mind, even when they’re wide awake. Meditators, intuitives, and healers have much more delta than normal. 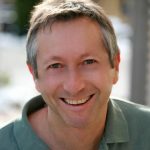 When our brains are producing delta, we are enriching our cells in a frequency that has the potential to produce a whole gamut of beneficial physiological changes at the level of our cells, from growing our telomeres and boosting GH levels to regenerating our neurons and sweeping our brains clear of beta-amyloid plaques. This is what happens during yoga nidra. Growth hormone secretion is at its highest when delta waves peak in the brain. Growth hormone repairs and regenerates cells. It is associated with the immune system, bone mineralization, muscle mass, fat breakdown and protein synthesis, growth and regeneration of all internal organs and homeostasis. Ahmed and Wieraszko (2008) took slices of the brain that governs memory and learning. They found that a very low delta band, 0.16 Hz, increases activity in the synaptic connections between neurons in the hippocampus. This suggests that memory and learning may be enhanced by delta activity. Beta-amyloids are sticky plaques between neurons in the brain, characteristic of Alzheimer’s disease (Kang et al., 2009). They found that during sleep, when brains are primarily in theta and delta brain wave states, beta-amyloid production in the brain stops, and toxic material is cleared away. The effect was even greater during the delta brain wave state. The ends of chromosomes have stretches of DNA called telomeres. Telomeres protect our genetic data, cause cells to divide, and slow aging. Telomeres normally shorten each time a cell divides. The resonant peaks for 10 telomere sequences clustered around a frequency window of 0.19 Hz and 0.37 Hz (delta). Other frequencies did not affect telomerase (Cosic, et al., 2015). 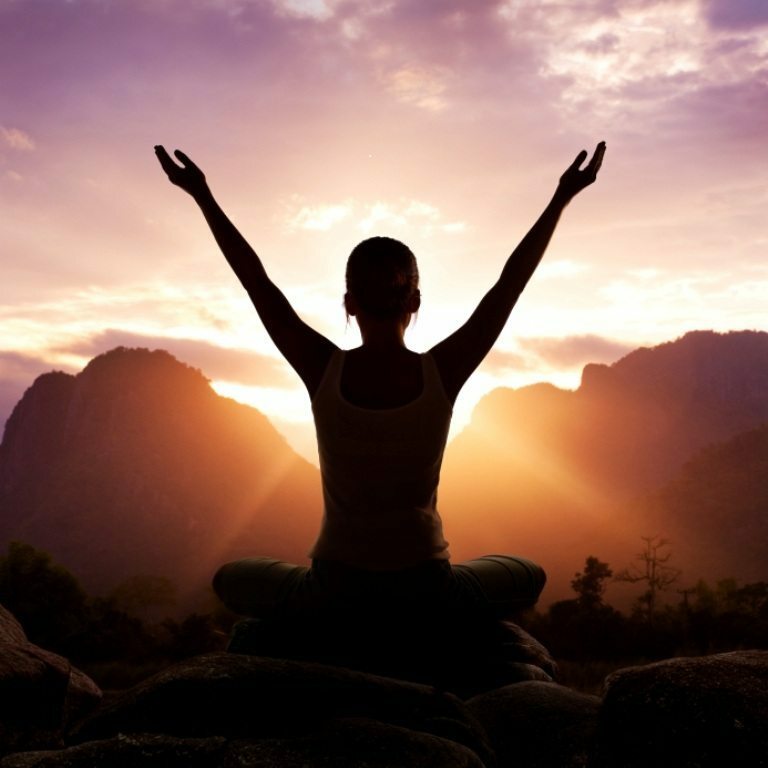 Meditation preserves and increases telomere length. Delta brain waves are seen on EEGs when people are having a sense of connection with the infinite. Anandamide, the “bliss molecule” inhibits the formation of cancer cells. Delta frequencies between 0.5 Hz and 3 Hz stimulate the regeneration of nerve cells (Sisken, et al., 2007). Gamma is associated with the integration of information from all the brain’s regions, as well as with coherence as they all synchronize (Gray, 1997). It’s associated with flashes of insight, performing difficult tasks perfectly. Meditation increases gamma. At 50 Hz, results in the body increasing its production of stem cells, the “blank cells” that differentiate into muscle, bone, skin, or whatever other specialized cells are required (Ardeshirylajimi, & Soleimani, 2015). At 60 Hz, expression of stress genes (cortisol) is regulated. A frequency of 75 Hz is epigenetic, triggering the genes that produce anti-inflammatory proteins in the body (De Girolamo et al., 2013). References: Much of this material is from Mind to Matter by Dawson Church, PhD. Hay House, 2018. Find your calm spot and brighten your energy for a more enjoyable, meaningful life. Benefit from six levels of relaxation to reclaim optimal health for your body, mind and heart. Laura, a HS teacher says "This focused my mind. I was 100% worry-free. It's easy to experience. Yoga nidra is wonderful." This is from Yoga Nidra for Complete Relaxation and Stress Relief, a book and audio set by Julie Lusk. 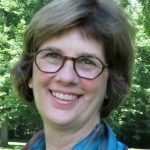 Julie eases your way into being more mindful with her clean, user-friendly, body-based, joyful approach. The net effect is calmer nerves, a brighter outlook, stronger memory, sharper focus, healthier body awareness and a more balanced perspective. With repeated use, listeners become more fully attentive to what is happening right now, neither resisting nor clinging to each moment, but letting experiences come and go and be just as they are. This program offers a 5-minute track of training tips; a long (18 min) and a short (6 min) mindfulness experience; and ways to be more mindful informally during the day (4 min). (39 minutes total) Published by Health Journeys. 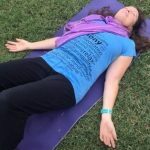 Yoga nidra is a powerful and unique state of relaxation, mental clarity and insightful awareness, done lying down. 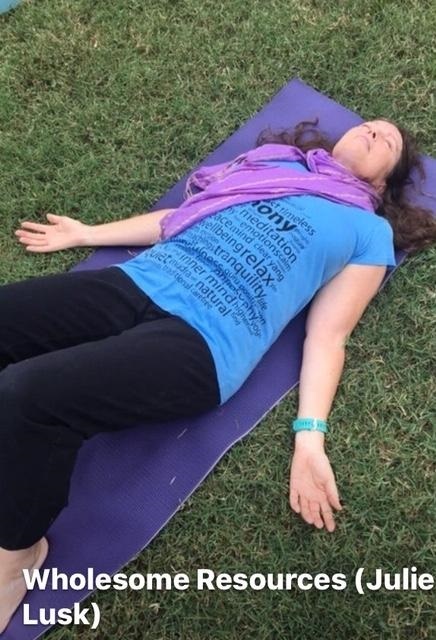 Julie's clear, step=by-step guidance for experiencing deep relaxation, specialized breathing, guided imagery, and mindful awareness, creates 6 replenishing levels of relaxation and a deeply meditative state. Restless thinking and emotional upsets tend to fade away. Used together or in segments, the net effect is to discover an inner reservoir of heartfelt peace, intuitive understanding and unconditional joy. Studies show one hour of practice is equivalent of about four hours of deeply restorative sleep. Published by Health Journeys. Brighten your energy with self-understanding for mental sharpness, emotional equilibrium and insightful awareness. Mindfulness, setting a sankalpa (resolve), autogenic training and the paradox of opposites will tame stress once and for all. 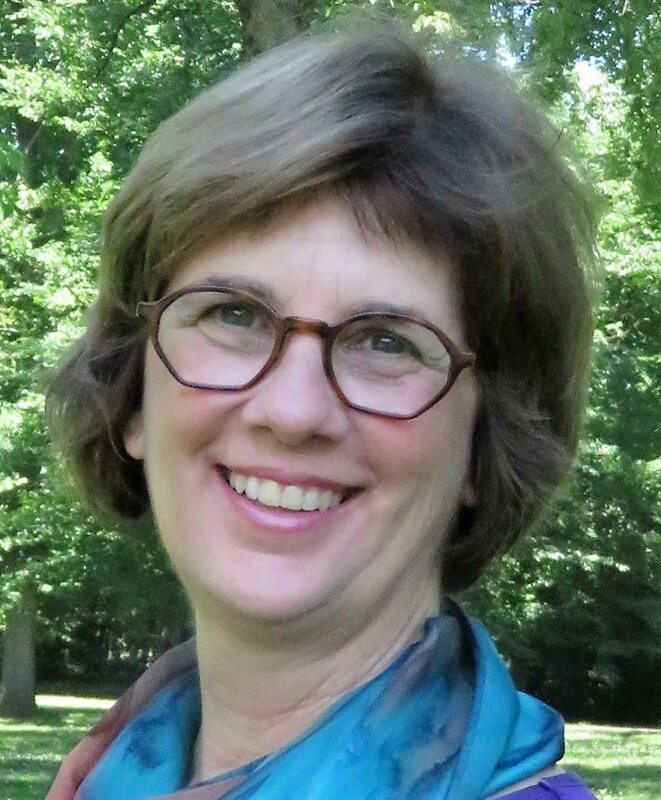 Jeanne, a musician and former nun says, "Exhilarating! This truly raised my spirit. I've never experienced such deep euphoria so easily. I felt so relaxed!" This is from Yoga Nidra for Complete Relaxation and Stress Relief, a book and audio set by Julie Lusk. Find your calm spot and live a more balanced, confident and meaningful life. Feel totally relaxed with an empowering tour of the bodymind. Guided relaxation and imagery are effectively used for balancing all your energy centers or chakras. Nancy says "This gets me totally calm and in touch with myself. Afterwards, I feel awake, refreshed, centered and ready for my day." This is from Yoga Nidra for Complete Relaxation and Stress Relief, a book and audio set by Julie Lusk. Experience six amazing levels of relaxation using progressive muscle relaxation and specialized breathing techniques that reliably work. Laura, a HS teacher says "This focused my mind and I was 100% worry-free. It's easy to experience. Yoga nidra is wonderful." 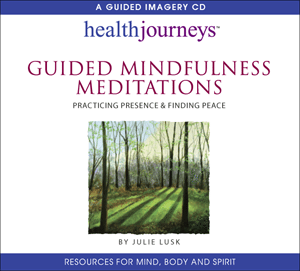 This is from Yoga Nidra for Complete Relaxation and Stress Relief, a book and audio set by Julie Lusk. 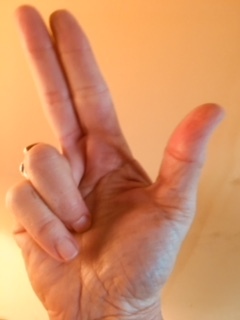 The Hakini Mudra for brain-body balance, problem-solving and focus is one of my favorite hand mudras. It’s very effective and easy to do. Mudras are yoga positions, gestures, and seals for your hands and fingers that facilitate health, healing, psychological balance and spiritual transformation. 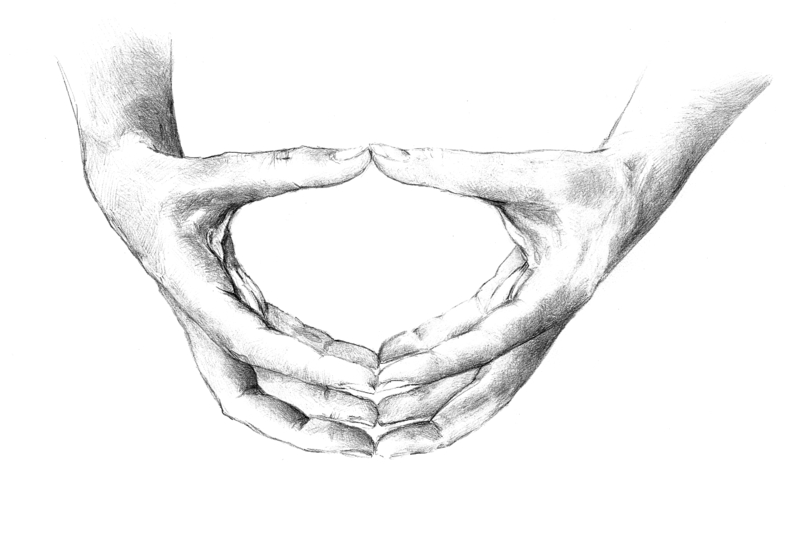 Some mudras use the whole body and breath. They are effective, easy to learn, practical and powerful, and anyone can do them. 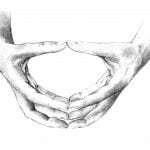 Learn more about mudras here. 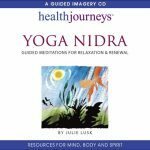 References: Yoga Nidra for Complete Relaxation & Stress Relief – Printed Book & Audio download, Julie Lusk. New Harbinger Associates, pg. 165-166. 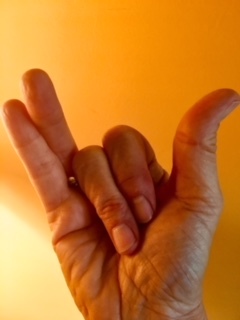 The hakini mudra illustration is from Mudras for Healing and Transformation and courtesy of Joseph and Lilian Le Page of Integrative Yoga Therapy. Their permission was given to use it in Yoga Nidra for Complete Relaxation & Stress Relief and associated materials. Many thanks to Dan Leven for sharing this Loving Kindness Face Lift. He was inspired by Sharon Salzberg’s book, Real Love. It’s a great way to start and end the day. I love it. I really go to town with spreading happiness and peace throughout my entire body. I enjoy coming up with new places to shower with loving kindness with each practice such as for my brain, blood, eyes and ears – even my hair. Before long, it’s going out to family, friends, pets, strangers and to all kinds of situations. This meditation is especially handy when my attention is restless since it lets me jump all around. It can be any length too – long or short. It sure feels uplifting. Come on – Give it a shot! PS. May you be happy and peaceful! Practice barefoot in the grass or on a sandy beach for some great grounding time. Here’s more about it. Stir in your own music, flow, fun, and friends. Finish with some floating yoga nidra bliss. Have a beautiful summer and come Yoga with us! Feelings of freedom, happiness, and joy!